The history of the Erinvale Estate Hotel & Spa is both long and venerable. This lovely historic resort dates back to the mid-17th century, when it once constituted a portion of Willem Adriaan van der Stel’s massive homestead. As the colonial governor for the Dutch colony of Cape Town, his enormous landholding produced a vast majority of the settlement’s food supply. While the current structure that now constitutes the resort first appeared in 1817, it did not become known as the Erinvale Estate until Edward Strangman acquired the location some five decades later. A transplanted Irishman, he bestowed the name “Erin Vale” upon the building in honor of his beloved homeland. The next three generations of Strangman’s descendants would go on to live at Erinvale. Today, the Erinvale Estate Hotel & Spa is one of South Africa’s most luxurious holiday destinations. Luxury awaits inside the spectacular Erinvale Estate Hotel & Spa. It offers 56 gorgeous accommodations that embody the elegant, yet rustic, character of South Africa’s breathtaking wine country. Fantastic tones of taupe and cream define every space, exuding an enchanting aura of tranquility that will leave guests in a state of complete serenity. The Erinvale’s signature restaurant, Seventeen07, serves a wonderful table d'hôte menu of delicious, seasonally-inspired South African fare. The resort also features a jovial Irish-style tavern called Skelligs Pub. A nod to the resort’s Irish roots, this warm, intimate venue is a great tribute to the Emerald Isle. And the Erinvale Estate Spa is a tremendous place to reinvigorate both the mind and body. Guests can receive a number of relaxing therapeutic techniques at the spa that will do much to enliven the soul. But the resort is not just a luxurious vacation getaway—it is also a wonderful destination to hold any kind of festive social gathering. 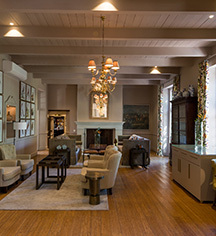 Tucked away within the historic Cape Winelands of South Africa, the Erinvale Estate Hotel & Spa is surrounded by countless cultural attractions that guests will find simply amazing. The resort in particular is situated in the heart of Helderberg, which is home to the famous wine-growing estates of Vergelegen, Lourensford, and Morgenster. Cape Town is just a short distance from the Erinvale as well, along with its grand beaches and renowned historical landmarks. Originally founded as a remote colonial outpost during the 1600s, the city has since become an international hotspot for vacationers the world over. Travelers have been especially drawn in by Cape Town’s close proximity to many natural wonders, including a beautiful UNESCO World Heritage Site known as the Cape Floristic Region. Nowhere is better to explore all of these remarkable locations than at the Erinvale Estate Hotel & Spa. 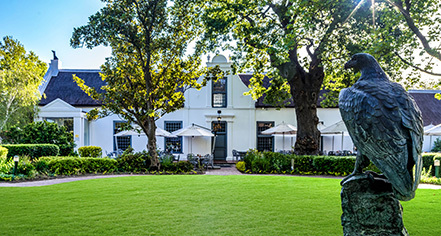 Erinvale Estate Hotel & Spa, a member of Historic Hotels Worldwide since 2018, dates back to 1666. In 1868, Edward Strangman bought the property for the sum of £800. Being an Irishman, he changed the name in memory of his home country to “Erin Vale” (Irish Valley). Airport Transportation: Airport transportation may be arranged through the hotel's concierge, rates apply. Cancellation Policy: Cancellations must be made 72 hours prior to arrival. Cancellation charges are calculated on the total cost of stay. Cancel within 28 days of arrival - 25%. Cancel within 14 days of arrival - 50%. Cancel within 7 days of arrival - 75%. Cribs and Pack-n-Plays: Available upon request. Deposit: Credit card deposit required - 50% of full stay will be deducted by the hotel after the reservations has been received and confirmed and the remaining 50% 30 days prior to arrival. Payment: Visa, MasterCard, Amex, and Diners Club are accepted. Smoking Policy: No smoking in guestrooms or public areas, outside designated smoking areas. The history of the Erinvale Estate Hotel & Spa is both long and venerable. This lovely historic resort dates back to the mid-17th century, when it once constituted a portion of Willem Adriaan van der Stel’s massive homestead. Learn more about the History of Erinvale Estate Hotel & Spa .